Have you had a chance to pick up Justice League Unlimited #42 and, if so, have you noticed what was changed or altered from the original 22-page story to fit into the new 20-page limit? 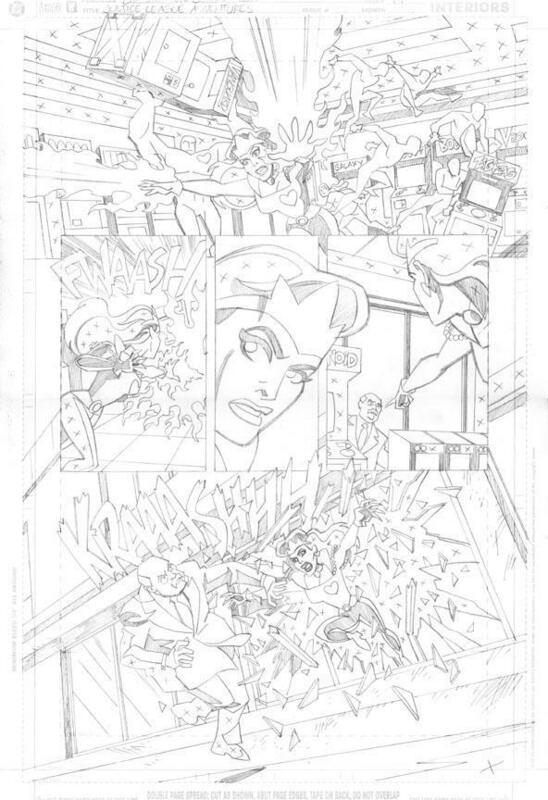 The original page 4 was deleted, which was the beginning of the sequence with Green Lantern and Wonder Woman talking about Una while responding to an emergency surrounding a burst dam. 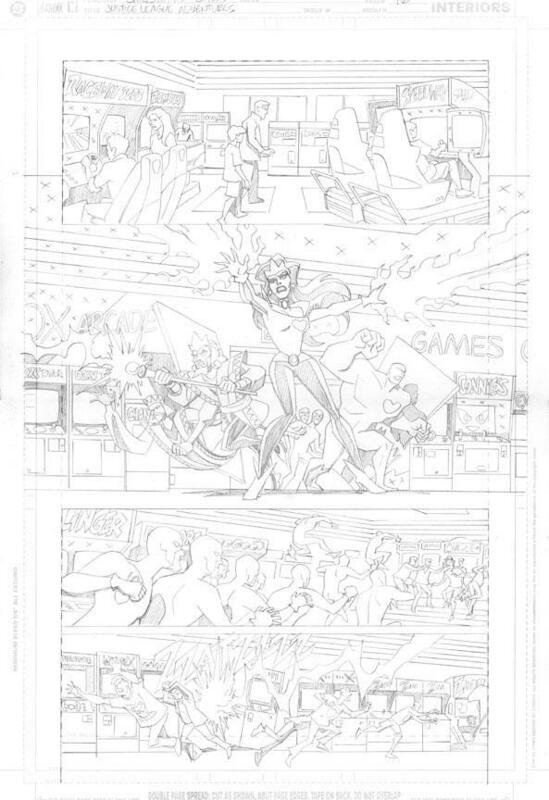 Pages 16 and 17 were combined to save a second page, which got the story down from it's original 22-page length to the 20-page size of Justice League Unlimited stories. I don't have the script handy to compare to and see what dialog changes were made. The main thing is just looking at my artwork from four years ago and seeing how far I've come since then. There are some nice moments - I'm particularly happy with the scene with Una getting a phone call from King in her apartment - but a lot of it seems a little stiff to me. But I'm always pretty critical of my own work. Having read the story myself, what drew you to the script? 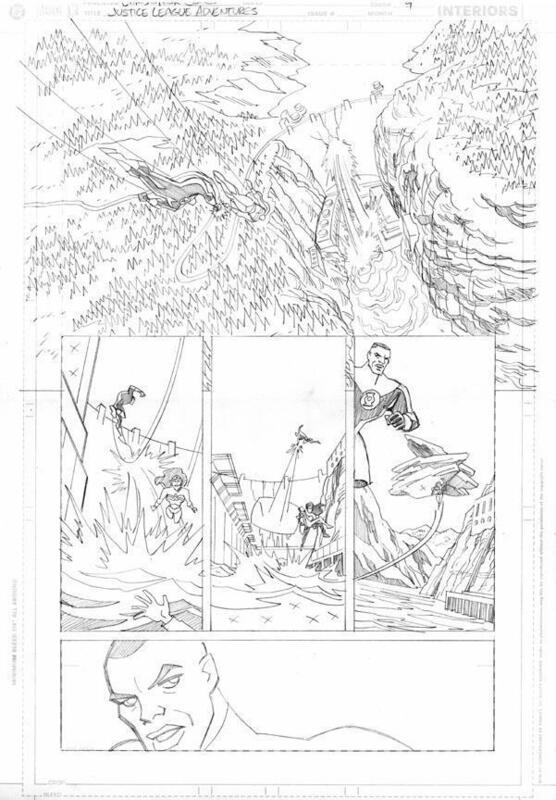 And, when reading the script, how do you approach providing artwork (ie: the tone, what angles to use, etc.)? It wasn't a matter of being drawn to the script. At the time it was just the next story I was offered. There were some battles on this one. My first take on Una was that she was the Matriarch of the group, and I drew her a little older, with attractive, strong features. My editor saw the first batch of pages when they came in and said he wanted her "prettier". He said "She looks like Annie Lennox!" Now I think Annie Lennox is HOT, so right there I knew it was going to be tricky reaching a compromise. While this week's The Batman Strikes features a fill-in artist, can you tell us about your next issue of The Batman Strikes, slated for March? My next issue is #43 which features Harley Quinn. Robin is essentially "grounded" for being reckless while on patrol and not using his head, but then while out on his own, Batman gets captured by Harley and her Henchmen. Now Robin has to exercise his detective skills and find Batman before Harley does him in on live television. It was a fun script and I had a great time drawing it. The next issue after that - #44 - features Superman, the Daily Planet staff, and Intergang! The following are Jones answers to our forum posters questions after our previous interview. Looking at the preview pages, I didn't know the Johnny DC titles were allowed to go that violent. Batman looks like he's bleeding when he's interrogating that guy at the club (though obviously the lack of colour makes it difficult to verify, but come on, he's not drooling...). Yep, he's bleeding. He's done it before and he'll do it again. Although it WAS the aftermath of a fight that takes place off panel. The funny thing is that when we do show violence that results in bleeding or other injury, because it's a Johnny DC title we have to show the responsible cleaning and treating of the wound. Most issues end with a 2-3 page sequence showing Alfred applying iodine to Bruce and then demonstrating how to pre-treat the stains on Bruce's costume before putting it in the wash. OK, not really. But one issue like that would be really funny. There's no real connection to the Batman Beyond episode. The Royal Flush Gang are from the comics, and have a history of reforming again and again with new lineups of individual members. 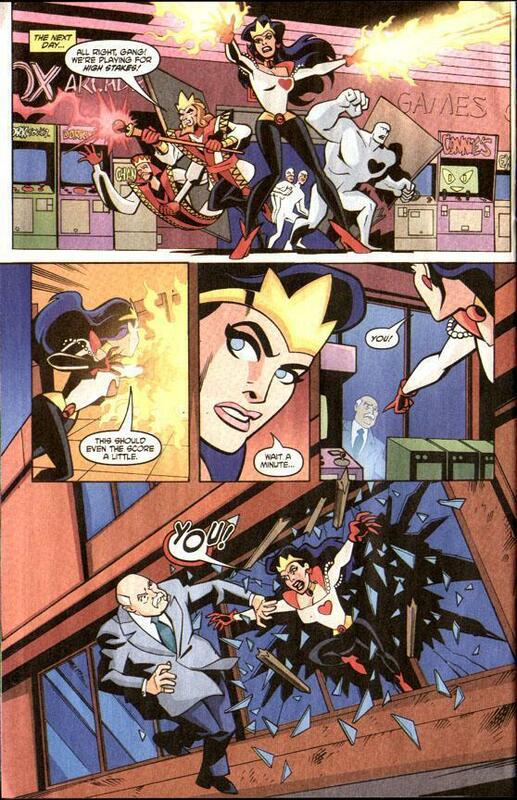 This story was originally written and drawn after the Batman Beyond appearance but was meant to be an earlier incarnation of the Gang with no members in common with the Batman Beyond Gang. Our Royal Flush Gang issue was originally done as an inventory story and for some reason sat in a drawer for a very long time, and yet another incarnation of the Gang appeared on the Justice League animated series that had no connection to what we had done in the comic. As confusing as this all can be, it's all par for the course for the Royal Flush Gang, who tend to be reinvented almost every time they appear in the comics. The interviews were good, but more information on the shows and how they relate to comics would have been appreciated. There's not that much direct connection. A couple of artists from the TV show (Dave McCaig and Producer Jeff Matsuda) have done cover art for the book, but that's about as far as they've been involved. The stories are developed by comics writers not associated with the TV show. While the stories try to fit into the continuity of the show, they are not adaptations of specific episodes or developed from ideas generated by the television writers. I look at model sheets and other artwork from the show to try to ensure that the characters look like their TV incarnations in my art, but otherwise I draw the book like I would any other comic title, and the approval process is just me and my editor, without any involvement from the TV series staff. During Seasons 1-4 of the series, we were limited to using supporting characters and villains that had already been introduced into "The Batman" continuity by the TV show, but now with Season 5 of the series expanding the universe to include the Justice League and other heroes from outside Gotham, we'll be seeing not only those characters but additional DCU characters in The Batman Strikes not yet seen on The Batman. I don't currently have any insider information on what happens to The Batman after Season 5 concludes (Cancellation? Season 6? Spin-off series? ), but I've been told that The Batman Strikes will continue for at least a while longer because DC wants to have an all-ages Batman title out there. The World�s Finest would like to thank Christopher Jones for his participation in this Q & A. To find out more about Christopher Jones, please visit his official website.